للمسافرين الذين يرغبون أن يعيشوا كل ما تقدمه المدينة، منتجع ألاماندا بالم كوف باي لانسمور هو الخيار الأمثل. يجذب هذا الفندق ذو 5 نجوم، والذي يبعد 30.0 km فقط عن وسط المدينة و 30.0 km عن المطار، الكثير من الزوار سنوياً. سوف يعشق النزلاء موقع هذا الفندق، فهو قريب من أهم المعالم السياحية في المدينة . استمتع بالخدمات الراقية والضيافة التي لا مثيل لها بهذا الفندق في هذه المدينة رائعة الجمال. إن واي فاي مجاني في جميع الغرف, خدمة التنظيف يوميًا, خدمة سيارات الأجرة, خدمة حجز التذاكر, مكتب استقبال 24 ساعة هي جزء فقط من الخدمات التي تميز منتجع ألاماندا بالم كوف باي لانسمور عن باقي الفنادق في المدينة. تعكس غرف الفندق البالغ عددها 58 المنتشرة في 3 طوابق جواً من الدفء والألفة.خدمات عصرية مثل مواد تنظيف, خزانة, شاي مجاني, غرفة ملابس, مناشف موجودة في بعض الغرف المختارة. صممت خدمات الاستجمام في الفندق والتي تتضمن جاكوزي, مسار جولف - ضمن 3 كم, مسبح خارجي, سبا, مساج لمساعدتك على الاسترخاء والراحة. مهما كانت دواعي سفرك فإن منتجع ألاماندا بالم كوف باي لانسمور هو خيار ممتاز لإقامتك في المدينة. The staff are amazing, helpful and friendly. The deluxe suite is massive and spacious. The NuNu Breakfast deal and free yoga/Pilates classes are perfect compliments to the stay. It is literally a stone throw away from the beach, and the facilities are all great. Loved our stay. 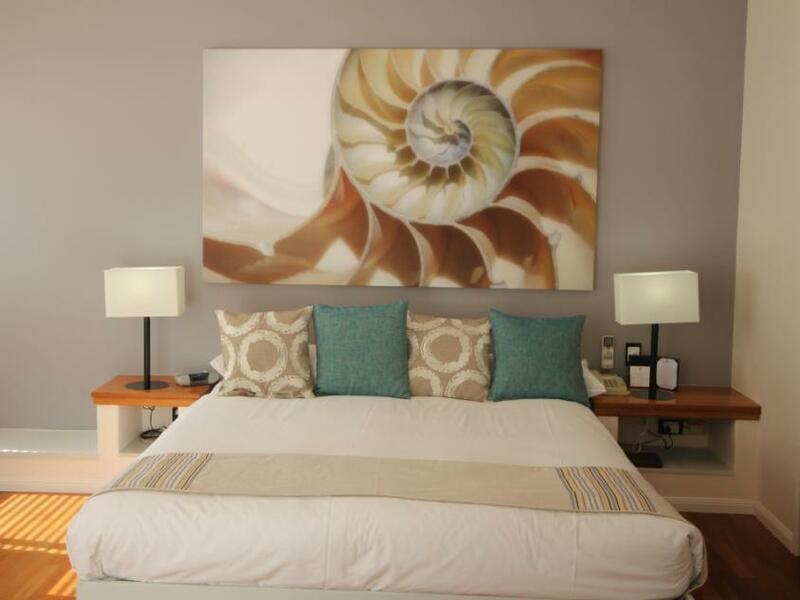 Alamanda Cove is in a fantastic location and the beachfront apartments has fantastic views and sea breezes. the apartments are spacious, comfortable and well appointed. The staff are professional and on top of any issues immediately. celebrated our belated honeymoon and last two nights before leaving queensland. would love to stay longer to enjoy our 2 storey suite equipped with a kitchen (oven, etc) and laundry (with dryer). rained during our stay and pity we didn't get a chance to use the two nice pools! stay was also so short we missed out on the highly rated restaurant. based on what we saw in palm cove, this would be the best hotel for sure! My family of 5 adults had a great stay, with spacious rooms and a surprisingly well equipped kitchen. Plenty of cutlery and crockery, unlike some other self contained apartments. Shame we couldn't swim infront of the hotel at this time of year, but the netted swimming area wasn't too far away. It's not really of 5 star standard, but it's a good 4 star place to stay. My husband and i stayed for 6 nights for our baby moon. We were really happy with the hotel. The location was great and the staff were all really friendly and helpful. The apartments was very large and spacious and the kitchen is well equipped. They offered numerous complimentary services such as yoga on the beach and my husband borrowed some fishing equipment one afternoon. Best of all, they had an adult only pool which is wonderful if you are trying to have a break from your own kids or dont want to have to deal with other people’s kids! Perfect location on the beach unlike any other hotel/resort , rock pool swimming pool meant we could swim all day til 9pm! Staff were friendly and very helpful! If your not a keen stair walker ask for a ground floor otherwise we would stay again in a heart beat with our children or as a couple! The staff are so friendly and nothing was too much trouble. The apartments were very spacious and spotlessly clean with a fully equipped kitchen as well as washing and drying favilities; the location is perfect and the only hotel right on the beach front. It's also very popular for weddings. Visited the spa while we were there and again the staff were great and very knowledgeable, we had a very relaxing couples massage. Would definitely stay here again we loved it! Stayed at 2BDR apartment. The staff was friendly and the resort was superb - location, facilities, and service. However, there was minor stuff like problems with fan regulator, broken bin etc. The staff attended to all these pretty soon. Overall, it was a great time spent at a great place! Would definitely recommend it to friends and family going to Cairns region. Reception staff are extremely accommodating and will go above and beyond to make your stay as comfortable as possible. The selection of 3 pools means there is literally a pool for every visitor type (adult, big pool and heated pool). Amazing location (only hotel that is actually on the beach). Great amenities and free yoga/Pilates. Awesome, spacious apartments. Only improvement could be giving the bathrooms a little more attention for cleanliness. I would return to Alamanda with no hesitation. We were three couples and had the 3 bedroom apartment overlooking the pool. It was a very spacious apartment with everything you need for a most comfortable stay. The staff were great, especially Cedric who checked us in! The master bedroom was very roomy with a nice ensuite and shower over the bath. We requested for the second bedroom to have a queen bed and the third bedroom was a king single in addition to a quite comfy rollaway bed. All in all, we thoroughly enjoyed our apartment and the property is beachfront. We made use of the adults only pool which was adjacent to the ocean. Great cafes and restaurants nearby! Would definitely recommend. From the moment you arrive this place treats you like an A-lister! Free champagne and yoga will always win me over. 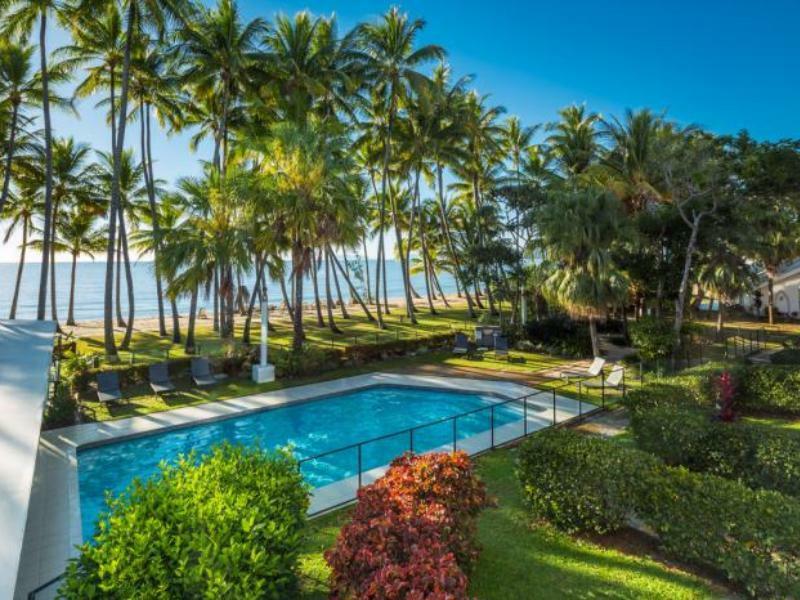 The location is the best in Palm Cove and the venue is one of the best i have stayed in. Perfect for families and couples of all ages. Our 2 bed apartment was huge and provided every amenity and service i could ask for - Miele appliances throughout, cooffee machine, fab mini bar, T2, and much needed AC. Everything is within walking distance and there are so many 5 star restaurants to choose from that you dont even need to eat at the hotel's acclaimed restaurant. For an indulgent holiday this is a certian winner. Great location and great hotel! Recommend suites on the first floor with ocean views. The facilities in this place are outstanding except for not having an elevator, that is why I give it a four star instead of a five. Definitely would choose this hotel if I return to Palm Cove. We found the level of customer service absolutely outstanding, and the organization of the wedding reception we attended, which was held at the complex was perfect. The quality and presentation of the food at the attached NuNu's restaurant was world class and the best I have ever been fortunate to experience. I would highly recommend the resort to anyone. Excellent service from reception staff who were the only staff we had contact with. Resort is at the end of Palm Cove so was very peaceful. It was great that we were also able to use the resort loungers on the beach. Being a worldwide traveller staying in luxurious hotels, I found this Lancemore outstanding at all levels. Tilly made us feel so welcome with the champers and chocolates. All staff went out of their way to make our stay fabulous. The studio was a large well appointed apartment with sea view. We were located in room 12 the first time and in room 33 during our second stay. Both studios were equally beautiful. We regretted that we booked 2 nights of our holiday somewhere else instead of4 nights here. I will definately be back. The service at the Alamanda was outstanding, the best we have ever encountered. The staff were so friendly and helpful even upgrading us to a beach view room half way during our stay. Sam in particular deserves a mention for his amazing service. The only slight glitch was the wifi which didn't work so well, but with a view like we had, we soon forgot about it. We will be back. 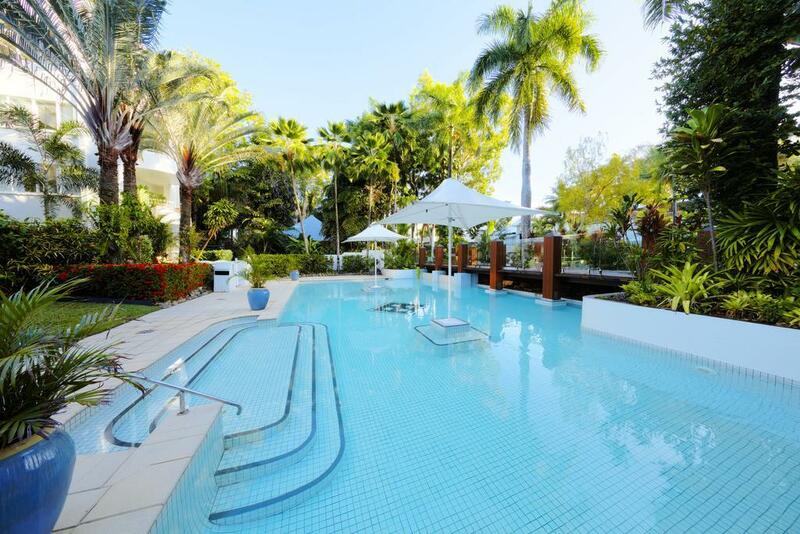 We had a wonderful winter break at Alamanda at Palm Cove this last weekend. We had a lovely suite which had a beautiful sea vista and which was only a short stroll to the sand and cafe. The reception staff in particular were amazing. They were so welcoming when we arrived and left and bent over backwards. They couldn't have been friendlier. Will definitely be back to stay at the Alamanda next time. Hotel staff very good and very friendly. Hotel in prime location and well maintained but starting to show its age. Restaurant has limited breakfast options if you include breakfast in package, restaurant staff can be quite rude.